1. Secure Loose Railings: If you home has steps—and subsequently, a railing—leading up to your front door, you’ll want to make sure there are no wobbles or loose screws. Young children, as well as the parents accompanying them, may need a bit of extra support, so get out your toolbox and make sure everything is tightly in place. 2. Keep Your Walkways Clear: As a child, I conducted most of my trick-or-treating while at a dead run from yard-to-yard, so it’s important to make sure that your walkways are free of things that could potentially cause a fall. Since most kids will be paying more attention to their candy than where they’re going—especially if it’s dark out—you’ll want to put away things like sprinklers, hoses, and stray bikes or toys. 3. Consider Using Fake Candles: While most of us light our pumpkins with real candles, if you have a small porch and are planning your jack-o-lanterns where people will have to walk, you may want to consider using battery-powered candles instead of the real thing. Costumes, paper decorations, and ornamental straw can easily catch on fire, so consider your setup before using real fire. 4. Think About Your Candy Choices: Although this is not something that most of us take into account, it’s worth considering since certain candies may present a choking hazard to the very young or cause a severe reaction in those allergic to peanuts. Check the candy’s bag for peanut warnings and if need be, use one bowl for older children and one for toddlers. 5. Turn on the Lights: Yes, a lit front porch signals to your little trick-or-treaters that there’s candy to be had, but it also helps prevent accidents once the sun goes down. If your yard has a lot of dark areas, consider utilizing some flood lights and make sure your entrance is illuminated. 6. Contain Your Pets: Sure, your pets may be very sweet, but some children are genuinely afraid of loud, barking dogs. Trick-or-treating only lasts a few hours, so make sure your animals are kept inside until the hustle and bustle dies down. At the end of the day, trick-or-treating is supposed to be a fun, enjoyable event, so it’s important to make sure your home will be a safe place for others to traverse during the festivities. 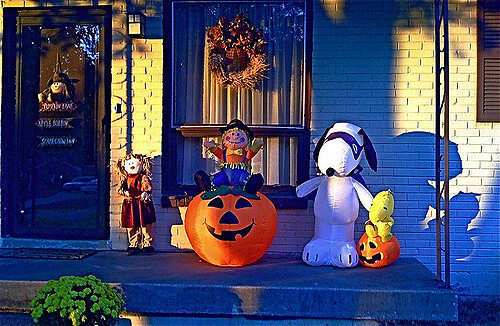 If you have any questions about how to spruce up your Halloween curb appeal or would like some advice on buying or selling a home, please contact me. This entry was posted	on Saturday, October 8th, 2016 at 4:49 pm	and is filed under Tips & Advice. You can follow any responses to this entry through the RSS 2.0 feed. You can skip to the end and leave a response. Pinging is currently not allowed.